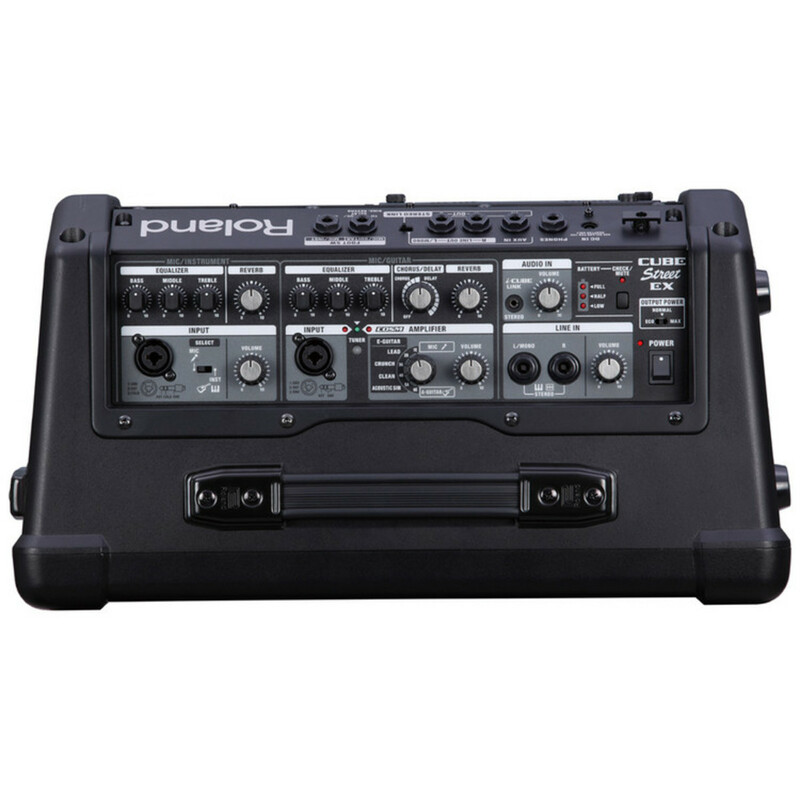 The Roland CUBE Street EX Battery Powered Stereo Amplifier is an all purpose, on-the-go amp and/or PA system. 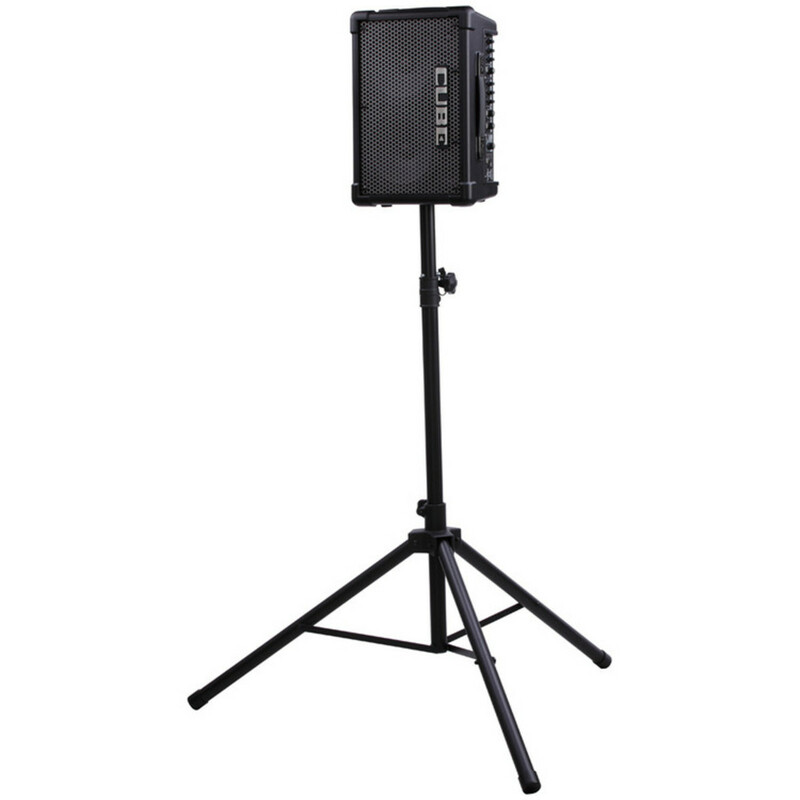 Perfect for street performers and travelling musicians, the CUBE Street EX is compact in size and bettery-powered for easy operation and transportation. Enjoy clean, punchy sound for larger crowds with 50 watts of power and a stereo speaker system with dual woofers and tweeters, while four independant channels offer abundant connections for a variety of mics and instruments, giving you incredible versatility. 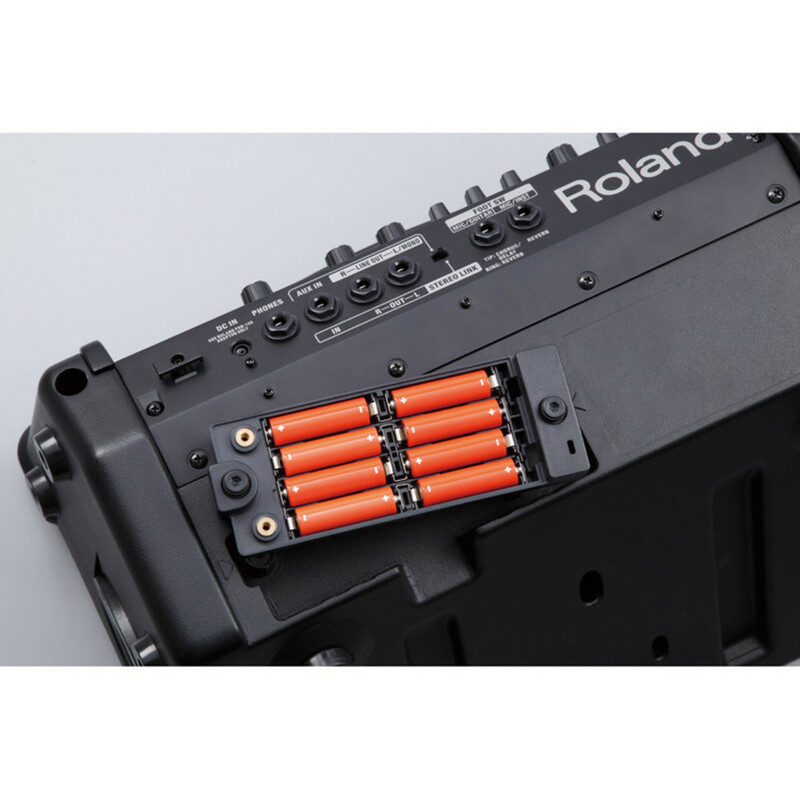 Selectable power modes provide up to 20 hours of operation with eight AA batteries, and two CUBE Street EX units can be linked together for more sound coverage if needed. And with i-CUBE LINK, you can even plug in your iPhone or iPad to play backing music and record your performances! 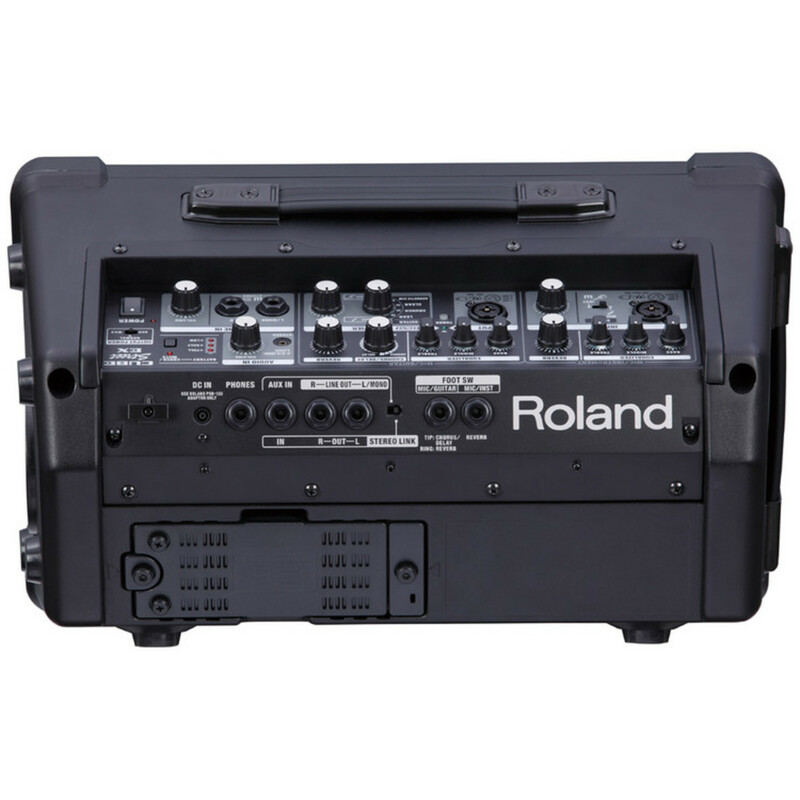 With its compact size and battery-powered operation, Roland's CUBE Street was a huge hit among travelling musicians. Now, the new CUBE Street EX infuses the popular mobile amp with a huge performance upgrade that delivers more projection, more channels, and more versatility. 50 big watts of power and a stereo speaker system with dual woofers and tweeters provide clean, punchy sound for larger crowds, while four independent channels offer abundant connections for a variety of mics and instruments. Detailed sound adjustment is available with separate EQ and reverb controls, and great guitar tones are dialled in easily with the on-board COSM amps. Selectable power modes provide up to 20 hours of operation with eight AA batteries, and two CUBE Street EX units can be linked together for more sound coverage if needed. And with i-CUBE LINK, you can even plug in your iPhone or iPad to play backing music and record your performances! Equipped with 50 watts of stereo power, two eight-inch woofers, and two tweeters, the compact CUBE Street EX effortlessly projects your musical performances with clear, dynamic sound. Thanks to unique new power circuitry developed by Roland, you can enjoy clean headroom and quality sound at a level that's impossible with any other battery-powered amp. The output power is adjustable in three levels-Max (50 W), Normal (25 W), and Eco (10 W)- allowing you to conserve battery life in situations where you don't need maximum power. In Eco mode, eight AA Ni-MH batteries will last up to 20 hours! The CUBE Street EX can also be powered with the included AC adapter at gigs where electrical power is readily available. The CUBE Street EX has an on-board mixer with four independent channels, providing ample connectivity options for all kinds performers. Mic/Instrument and Mic/Guitar channels feature XLR/TRS combo jacks to support microphones or devices with 1/4-inch outputs, and each channel is outfitted with its own three-band EQ and reverb effect for discrete sound shaping. The mono/stereo Line In channel is equipped with 1/4-inch jacks, while the Audio In channel provides a stereo 1/8-inch mini jack that also supports i-CUBE LINK. If you fill up all the channels, you can use the rear-panel Aux In jack to connect an additional mono device if needed. The CUBE Street EX makes it easy for guitarists to plug in and get pro sounds immediately. COSM tones for electric guitar include Lead, Crunch, and Clean, plus an Acoustic Simulator for extra versatility from a single axe. There's also an AC preamp optimised for acoustic/electric guitar and a convenient built-in tuner. Chorus/delay and reverb effects are available as well, and these can be turned on/off with optional footswitches while performing. Roland's innovative i-CUBE LINK interface lets you incorporate your iPhone, iPad, or iPod touch into your performances with the CUBE Street EX. i-CUBE LINK connects to your device's audio jack with the included cable, providing two-way communication with your favourite music apps. Roland?s free CUBE JAM app is an ideal partner, allowing you to play along with music tracks from your iTunes library and record the CUBE Street EX's output right back into the app. CUBE JAM also includes a number of useful functions for practice, jamming, and performing, such as independent pitch/speed adjustment and Centre Cancel for minus-one playing and karaoke. When placed on the ground, the CUBE Street EX's angled back provides excellent monitoring for performing in street situations and on larger stages. If you need broader sound coverage for bigger crowds, the amp can be mounted on an optional ST-A95 Speaker Stand. With the handy Stereo Link function, two CUBE Street EX units can be used together to create a powerful stereo PA with up to eight separate inputs. Like all amps in Roland's renowned CUBE series, the CUBE Street EX is built to last. It features a high-strength ABS injection-moulded body that's passed rigorous durability testing, ensuring reliability in all kinds of outdoor performing situations. 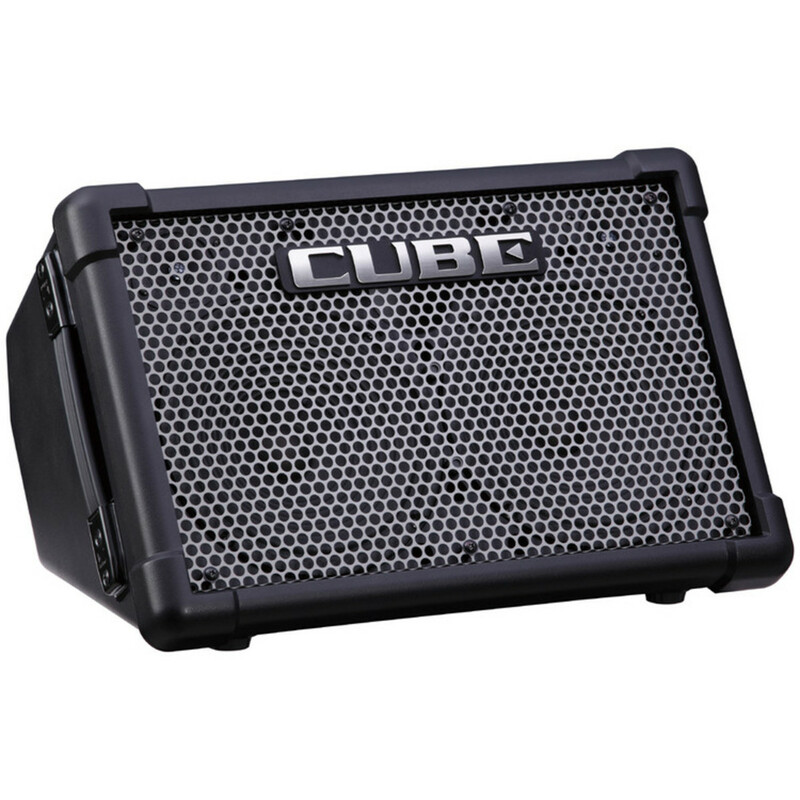 In addition to being tough, the CUBE Street EX is surprisingly light, making the amp a breeze to carry from gig to gig. An optional CB-CS2 Carrying Case provides a convenient shoulder strap and accessory pockets, plus a water-resistant covering that protects the amp from moisture while traveling.